Experience the real Australian outback! After seeing all the sites by air, land at a working cattle station, Kings Creek Station. 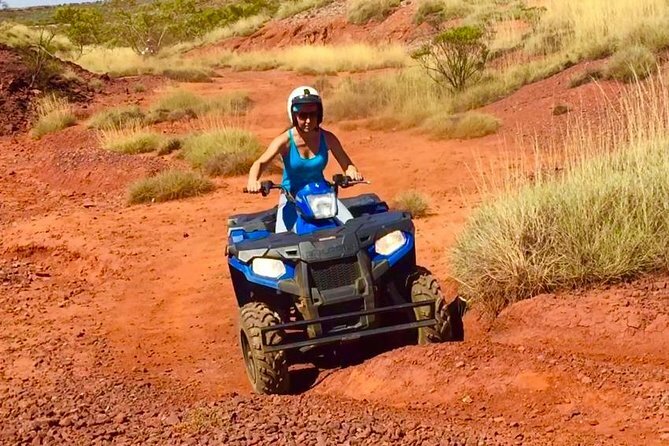 Take a quad bike safari and journey through magnificent Desert Oaks, cruise over rolling red sand dunes, pausing occasionally to take in the vast views and roaming wildlife. Minimum age 16 years for the quad bike, no experience necessary. Experience the real Australian outback! Fly over Uluru, Kata Tjuta, Lake Amadeus and Kings Canyon, seeing it all. A 10 minute flight from Kings Canyon, we land at an outback dirt strip at Kings Creek Station where we then take a short 5 minute drive to the station. There is a cafe at additional costs, serving fresh sandwiches to camel burgers! After a short lunch break, you will take a quad bike safari and journey through magnificent Desert Oaks, cruise over rolling red sand dunes, pausing occasionally to take in the vast views and roaming wildlife. Minimum age 16 years for the quad bike, no experience necessary. If you would like to do the creek bed walk out at Kings Canyon, this can be arranged at an extra AU$50 per head paid on the day. Please advise staff and also allow an extra 2 hours for the tour. Flights depart from sunrise all through to sunset.